The main aim of the book is to assist learners to put theory into practice – how to actually DO something, rather than just knowing how to do it. This handbook emerged from my experience as a lecturer in event management over the past eighteen years. During my interaction with both full-time and part-time learners, I realised that the prescribed handbooks were pitched at too high a level (as some of the learners were entry level) and did not take the South African event management industry into consideration and that the examples used were either in a British or Australian context. South African learners struggled to relate to these examples, as some of them have never been out of the country. Another concern was that the majority of the current handbooks were highly theoretical, barely referring to practical examples. 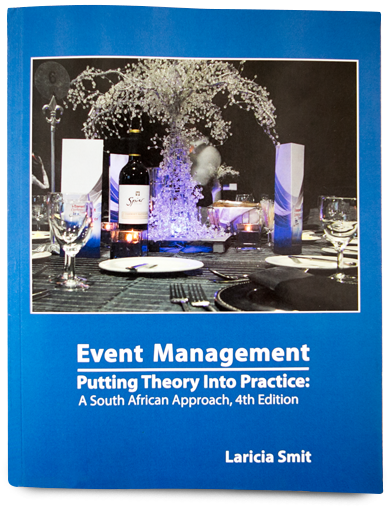 The book provides learners with actual tools – templates and checklists that they will need as effective event managers. Many such questions went unanswered because the current material did not do so. The content of the book has specifically been developed to meet the needs of both learners and practitioners in the industry. Part A is an introduction to event management and strategy. 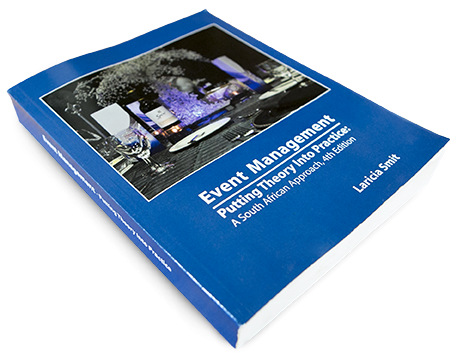 The hard-core theory and fundamental principles of event management are covered in the first two chapters. Part B is about putting theory into practice. There is a strong theoretical undertone in these chapters, but practical examples, tools, illustrations and templates will provide the learner with know-how. Part C introduces the learner to corporate event management and highlights the differences between corporate and consulting event management. This part of the handbook also introduces learners to the entrepreneurial skills required to start their own event management company, and how to pitch for an account. Part D gives a brief overview of event tourism and the international event management industry. This section is an introduction to the relation between events and the tourism industry. Part E includes all the templates covered in the handbook. These templates have been provided on the CD accompanying this book. Part F provides a broad overview of how events such as the International Metal Casting Conference and the 3rd BRICS Foundry Forum as well as South Africa’s biggest infrastructure project, Gautrain Rapid Rail Link’s, events have been conceptualised, implemented and evaluated, including the risk management of the Tunnel Breakthrough event. It also provides a case study on an exhibition hosted by the Intelligent Transport Society of South Africa.